Successfully Added Multifunction Camera Hat (MP3 Player, Bluetooth, Remote Control) to your Shopping Cart. Multifunction Camera Hat - look cool while listening to music, secretly recording videos and answering calls! 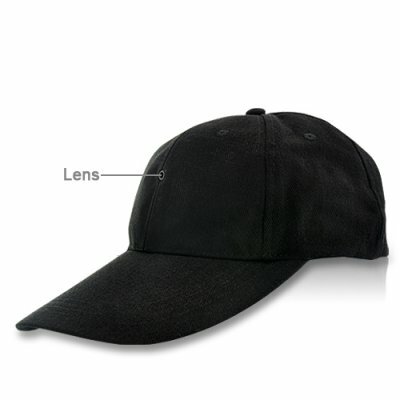 This stylish hat, besides providing a protection against UV rays, is also a great hidden video recorder, a MP3 player and can be paired with your phone to dial/pick calls hands free. It means it is a very nice and useful gadget for your next summer holidays at the beach or your frequent outdoor activities such as riding and hiking. And since it really looks like a normal cap you understand how awesome this multifunctional hat is! Wearing this wonderful hat is very convenient. Indeed its dimensions and weight are similar to caps sold in any shop. It is mainly due to the well-sized camera and extremely small pinhole lens, which is hidden within a rivet in the hat! So even if people are looking directly at the cap, they won't notice anything! Not only record hot girls at seaside but also capture all of life's spontaneous moments and document your daily adventures. This lovely hat comes with a 2GB TF card to provide enough storage capacity for hours of high quality video (with audio) and music. It also reads MP3 and WMA files, which allows you to relax without wires getting tangled up with your arms or player falling down from your pocket. A good point to chill at swimming pool or climb dizzy cliffs of Great Canyon! What more? With Bluetooth function pick calls while keeping your hands on the steering wheel of your open-top luxury car! Hurry up to get this fantastic camera hat before we run out of stock and start enjoying all its features in a few days! All this is brought to you by the online leader in high-tech devices, Chinavasion.